Calling all paper-crafters and scrapbookers.... I need you!! Join us on 1 August 2009 to celebrate Christmas in July in August. Put this date in your diary now, for an afternoon of Christmas Creativity, Fun & Inspiration. Designed for both Scrappers and Card-makers alike, you'll be sure to find your perfect project to get you on track and ready for Christmas! I have 5 spots left I need to fill! So what will we be making? Make the stylish card tote with four pocket cards & designer envelopes, matching pen and notepad set. Enjoy this project again and again with full colour instructions to make these as gift sets at home. If scrapbooking is more your style, we have the Snow Swirled Scrap Pages designed just for you! Use the same papers, colours and accessories. Design your own pages or follow the templates and instructions to make two pages in time for Christmas. Just add photos. You'll also be making the note pad and pen, to write your notes on! Take a seat, make a cuppa and enjoy your specially prepared kits. All kits will be prepared for you with enough goodies to make your chosen projects.. I will provide the inks, stamps, punches and all materials to make your projects. Just bring along your scissors, cutters (if scrapbooking), and your smile! Enjoy light refreshments, door prizes and your goodie bag (kit). Option 1: $72* - Includes the Snow Swirled Stamp Set, instructions and materials to create the Cards & Tote Project OR the Scrapbook project. Bonus inclusion: Instructions for both projects! Option 2: $25* - Includes all instructions and materials to create the Cards & Tote Project. 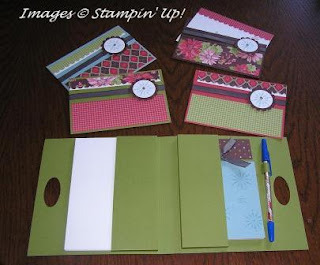 Option 3: $25* - Includes all instructions and materials to create the Scrapbooking Project. For more information or to reserve your place - email me to RSVP! What if I can't get there? You can always enjoy these Snow Swirled Projects at home. I really hope you'll join me and enjoy an afternoon with Christmas in July projects. Meet new friends or invite your own friends. You will be glad you did!